Ultradent is filled with smiling faces, and they’re not just advertisements for the company’s dental care products. Located on the outskirts of Salt Lake City, Utah, Ultradent has become an international leader in dental manufacturing with a rich history of innovation and quality. Founder and CEO Dr. Dan Fischer attributes most of the company’s success to five core values: integrity, quality, hard work, innovation and care. 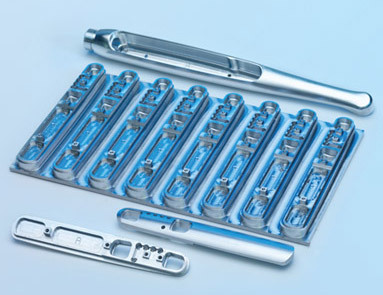 A key to Ultradent’s success has been the establishment of an internal mold shop for their dental manufacturing. This shop handles high-performance machining and works hand-in-hand with the company’s R&D engineering group, developing prototypes internally and doing manufacturing research and development with turnaround times as short as two days. Over three decades ago, a young and aspiring Dr. Fischer established Ultradent in the basement of his house with the assistance of his family. Dissatisfied with many of the dental products available to him, Fischer worked tireless evenings and weekends researching and developing new and improved oral care products. Fischer’s first breakthrough came in 1979 with the development of a successful hemostatic solution called Astringedent®. This set the pace for a succession of products that would exceed expectations in the dental manufacturing industry. Within a 12-year period, Ultradent grew from an operation based out of a home to a 220,000-square-foot facility. Today the company has subsidiaries in countries across the world, including Germany, Italy, Brazil and Japan. Ultradent now manufactures and packages more than 500 materials, devices and instruments used worldwide by dentists, group practices, dental and veterinary labs, government agencies and universities. Fischer continues to play an active role in the company while also lecturing, developing articles about state-of-the-art dentistry and connecting with patients at his daughter’s dental practice. “Dr. Fischer is a very hands-on type of guy who likes to be involved in every step of the manufacturing research and development process,” says Krumpelmann. “I speak with him in person two or three times a day regarding his latest ideas, our design concepts and overall project status. He’s very open to feedback from designers and engineers, which has been conducive to the development of new products. In 2003, Ultradent invested in a Makino S56 to gain full control of their R&D process with high-performance machining capabilities that previously required outsourcing to perform. The machine was purchased with several upgrades, including a 20,000-rpm spindle, 5th-axis rotary table and a laser tool-length measurement system. An additional benefit to their investment in the S56 is the ability to test prototypes on the spot to find and fix any potential design errors. One of the first prototypes created on the S56 was Ultradent’s Valo product, an LED light wand capable of curing underlying resin cements. Using the same tooling, programming, speeds and feeds as the company’s previous machinery, the S56 produced a noticeably better surface finish and smoother contours without any manual finishing labor. The differences Ultradent observed between the S56 and other previous machines led to additional Makino investments in 2009, including a second S56, an SP43 wire EDM and an a61 horizontal machining center with 4th-axis NC rotary table with pallet changer. One recent application performed on the SP43 was an endo file gauge used to check cleaning files used during root-canal operations. While the product features a simple flat-metal-plate design, the gauging slots range in size from 1/16 inch to 0.005 inch with a one-degree taper. To facilitate greater accuracy in part setups, Ultradent also produces several custom fixtures using their a61 horizontal machining center. 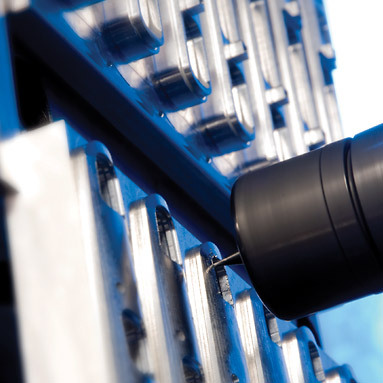 Designed in the same CAD software used for their part and mold designs, this fixturing device eliminates the need to dial in datum points, as they are already programmed into the CAD software. Ultradent has designed fixtures for both their vertical machining centers as well as the tombstones used on their a61. Transfers between vertical and horizontal machining centers are simple, reliable and can be performed in a matter of minutes. The shop is currently engineering a way to transfer fixtures between the milling machines and the SP43 as well. 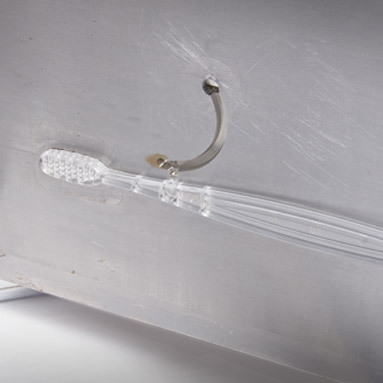 Ultradent’s internal investment in high-performance machining capabilities has enabled them to produce R&D molds with turnaround times as short as two days. Using their custom-designed tombstone fixtures, Ultradent is able to produce nearly 1,000 parts each week on the a61. 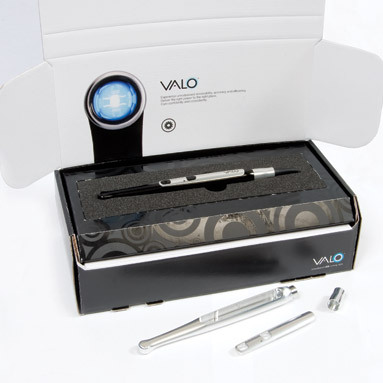 One of the machine’s primary applications has been an aluminum cover plate for the Valo light wand. Each run accommodates 32 parts and can be produced in less than four hours, a 60 percent cycle-time reduction compared to their previous CNC machines. The mold shop’s productivity also impacts other departments of the company’s product development. During the development of a new type of toothbrush bristles, a request came through for a toothbrush handle mold for internal bristle testing. The company was able to produce the mold over three nights on the a61 and another day on Ram EDM for bristle slot finishing. Design, testing, production and delivery were complete in less than two weeks—a faster, more cost-efficient solution than purchasing from an outside vendor. 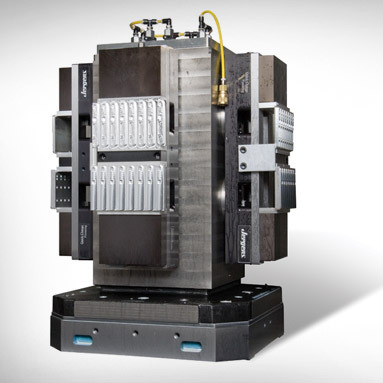 The company’s Makino investments have provided R&D engineers with greater flexibility in their part and mold designs, adding smooth contours and geometries for the customer’s comfort. Ultradent is committed to its vision, mission and core values. 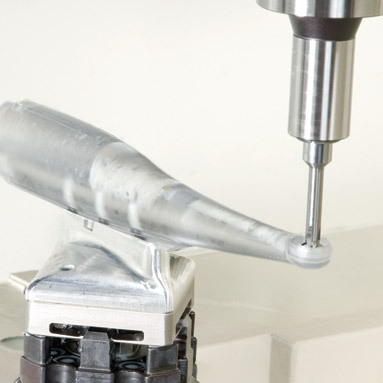 By continuously improving its high-performance machining capabilities, the company is meeting its goal for improved human oral health care throughout the world. “Our management maintains a high level of commitment to our dental manufacturing capabilities through training programs, seminars and investments in high-performance machine tools" says Krumpelmann. "Since purchasing the Makinos, our product development process has gained greater flexibility, higher quality and a faster time to market than ever before. The products we produce are proof that with integrity, quality, hard work, innovation and care, we can continue to lead the industry in top-quality dental care products." Using their custom-designed tombstone fixtures, Ultradent is able to produce nearly 1,000 parts each week on the a61.